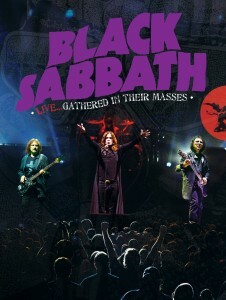 Black Sabbath’s live return to outdoor shed and theaters post the release of their recent “reunion” album, 13, just this past summer makes up the document of 16 songs that is Live…Gathered In Their Masses. The first real song here recorded from two shows they performed in Melbourne, Australia during late spring of 2013 is “War Pigs” (there is a mishmash, prerecorded intro) with the crowd singing along. New drummer Tommy Clufetos’ chops are evident from here as are Tony Iommi’s heavy power chords, and Ozzy’s definitely up on his swearing. The riff-tastic plodding opening to the “Into the Void” follows (the crowd chanting along with the “heys”), then the band starts to swing under Ozzy’s slightly tired vocal. The tail end showcases Iommi in a blistering lead. The band stomps all around “Fairies Wear Boots.” Again Butler is great, but it’s Clufetos who makes a fantastic showing and “System Of the Universe” is basically a drum solo showcasing his solid double bass drum ability. We’re into “Ironman” then, Iommi’s distinctive bending riff causing chills, the band keeping down a solid low end on this classic as the crowd sings along. You got to give these old guys credit, running through a good litany of their stuff from their first album, cuts from Sabotage and Paranoid and new nuggets. And while original Sabbath drummer Bill Ward is missed (as much for his playing as to see the actual original band re-form), Clufetos truly does light a fire under these guys.